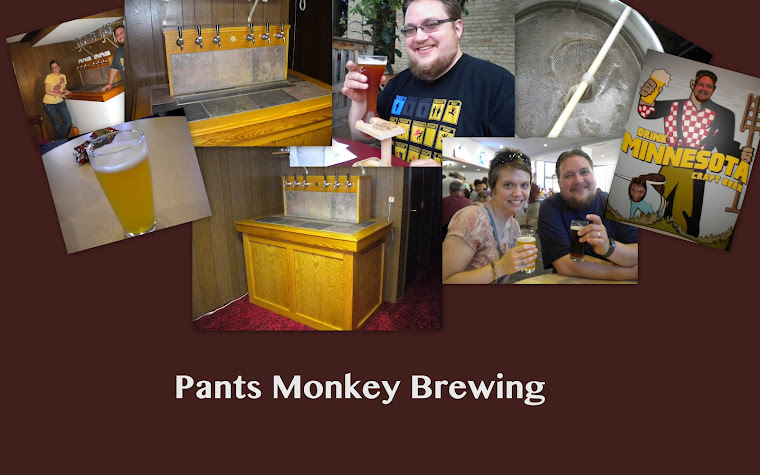 Pants Monkey Brewing: Brewing your first beer! I suggest you read through this entire article at least once before starting your first brew. This isn't something where you want surprises part way through the process your first time through. The day is finally here. You've purchased all the equipment you need, you've come up with a recipe to brew and purchased all the ingredients, and you're ready to brew. Lets go through your first brew step-by-step. Before we start, I'm going to make a few of assumptions about your first brew. First, I'm going to assume you're using an extract based recipe with specialty grain. If your recipe doesn't include specialty grain, that's OK, I'll let you know which part of these instructions to skip. If you're making an all-grain recipe, I'm afraid that all-grain brewing is really outside of the scope of this article. I'll be covering all-grain brewing at some point, but not today. I'm also going to assume that you're using dry yeast for your first batch of beer. If you're using liquid yeast, that's great, it's just a bit more advanced than what this article is intended for. I'll be writing an article about how to properly use liquid yeast in a couple of weeks. Lastly, I'm going to assume you're making a 5 gallon batch of beer. Just scale any measurements I give up or down as appropriate. 1.) Malt extract, liquid, dry or both. 2.) Specialty grain, if applicable. Make sure they're crushed. It's always easiest to have the store you bought the grain from, crush it, but you can do it yourself at home by putting the grain in a plastic bag and crushing them with a rolling pin. Failing that, you could put the grain in a food processor and one or two quick pulses should be OK. This isn't ideal, and make sure you aren't turning the grain into powder. You want the grain lightly crushed, not turned into flour. **Note** If you have specialty grain, you'll also want a muslin or nylon mesh bag to put the grain in while it's steeping. If you bought a recipe kit, usually the kit comes with such a bag, if not, you'll want to buy one. You don't want the grain free floating in the wort (unfermented beer). 3.) Hops. It's possible that you might not actually have this if you bought a kit as some kits come with hopped malt extract. The beer will be better using actual hops instead of hopped extract, but it isn't strictly necessary. 4.) Yeast. For this post, I'll assume you're using dry yeast, but if you have liquid yeast, that's fine too. 5.) Water. This one might sound obvious, but I bring it up for a reason. The quality of your water will affect the quality of your finished beer. If your tap water tastes terrible, consider buying some water at your grocery store. If you do buy water from a store to brew with, be aware that RO (Reverse-Osmosis) water is actually too pure to properly brew with without adding additional minerals/salts to the water, which is outside of the scope of this article, but I may go into at a later date. Have everything together? Great! Now make sure all of your equipment is clean. Remember, this is a food product you're working with. If you'd be unwilling to let raw food touch any of the equipment that the beer/wort is going to touch, it's not clean enough. You need to clean all of your equipment, but you only need to sanitize the equipment that will come in contact with the wort and beer after the wort has finished its boil. This means you need to sanitize things like the inside of your fermenter, your hydrometer, if you're using a funnel to help you transfer the wort into the fermenter, you'll need to sanitize that as well. If you take a sample of the beer later, you'll want to sanitize whatever you're using to take a sample of the beer. It's very easy to infect your beer (introduce unwanted bacteria/fungus/etc.) before fermentation has begun, and, while harder, still possible to infect the beer while fermentation is underway or has finished. Use a sanitizer like Star San or Iodophor. Carefully follow the instructions that come with the sanitizer. OK, you've got everything you need together. The first part of the brewing process is steeping your specialty grain. Fill your brew pot with water, making sure you leave at least a few inches of space from the top of the pot. If you have a larger, 7.5+ gallon pot, put roughly 6 gallons of water in the pot. While you're aiming for 5 gallons of beer, you want more than exactly 5 gallons of water because some of the water will evaporate out while you're steeping/boiling the wort. You might find you need either more or less than 6 gallons of water to have 5 gallons of wort to put in your fermenter, but the amount you actually need is different for everyone as it depends on things like the size and shape of the brew kettle, the burner, the weather and your altitude. 6 gallons is a pretty safe starting point. If you don't have a 7.5+ gallon pot, put as much water in the pot as you can, again, leaving plenty of space at the top of the boil kettle as it will foam up quite a bit as you brew. Aim for at least 2 gallons of water if you can. We'll add more water to the fermenter to bring your total volume up to 5 gallons at the end. Next, heat the water to around 155ºf. Temperature isn't super important for steeping specialty grain, but you want it to be warm enough to help extract the flavor from the grain but not so hot that it starts extracting too many tannins from the grain, which would give a bitter, generally unpleasant flavor to the beer. Anywhere from 150-160ºf should be fine. Put your crushed grain into your grain bag (the muslin or nylon bag mentioned earlier) and soak/steep the grain in your pot for about 30 minutes. Keep the temperature of the water around 155ºf while you're steeping the grain. After 30 minutes, take the grain out of the pot and dispose of it. Do not squeeze the grain bag to drain the water back into the kettle, especially if it's a muslin bag. You'll likely end up squeezing some grain out of the bag and into kettle, and when you bring it to a boil, you'll end up extracting tannins from the grain into your wort, which can negatively affect the flavor of your beer. This step requires a bit of decision making on your part. You want to add at least some of the malt extract at this point, but not necessarily all of it. If you're doing a full boil (boiling all of your water in one pot at the same time) you can add all of your malt extract now without much of an issue, and it is likely how the designer of the recipe assumed you would make the beer. If you're doing a partial boil (only boiling some of the water now and will add more water at the end), you'll likely overcook the sugars in the malt extract, caramelizing them, if you try to add all of the malt extract now. Your best bet in that case is to only add about 1 lb. of the malt extract now and add the rest during the last 15 minutes of the boil. You can also do this with a full boil, which will give you a slightly lighter, more fermentable wort. Whichever way you go, turn off the heat for your boil kettle and add the malt extract to the water. Stir the water/malt extract mixture until the malt extract has completely dissolved into the water. It will take a bit longer than you might expect. A good rule of thumb is to stir until it's completely dissolved, and then stir for another minute. Congratulations, you've made wort! We're not done yet, there is still quite a bit to do, but hey, this is an important milestone for you. ** Note ** be careful with dry malt extract when adding it to the wort. Dry malt extract is actually extremely flammable. When making my first beer, I left the burner on, opened the bag of dry malt extract, and proceeded to accidentally spill a little bit of it. I ended up engulfed in a giant fireball. Luckily, other than some singed hair (all of which grew back fine) and having a very frightened wife screaming because she saw her husband go up in flames, I was none the worse for wear. At this point, you've steeped your specialty grain and added at least some of your malt extract. Start heating your boil kettle and bring it to a boil. Do not wander away while you are doing this! As you get close to when the wort actually starts boiling, a layer of foam will form on top of the wort. This layer of foam traps in heat, allowing the wort to actually exceed the temperature it would typically boil at. The superheated wort will boil over the side of the kettle and make a sticky mess that is difficult to clean up of you aren't paying attention. You will see the foam on top suddenly start to rise very quickly. When this happens, turn down the heat, use a large spoon to stir the wort, you can even take a spray bottle full of water and mist the top of the foam to help it collapse. Your main goal here should be to keep things under control until the wort stops trying to foam over the top of the brew kettle. After a few seconds, maybe a minute, the foam will collapse into the wort, and you'll be left with a nice rolling boil. Here is my one secret to making a good beer, and I don't make much of a secret out of it as I will proclaim it to anyone who will listen. You want the heat on the boil kettle to be as low as possible, and still have it boil. I used to pride myself on how high I could get the burner, how violent I could make the boil without it overflowing the brew kettle. But as I got the heat higher and higher, the sweeter and sweeter the beer ended up tasting, to the point where I was making beer I didn't want to drink because it was too sweet. Why? Because the sugars in the wort were caramelizing, and yeast can't consume the caramelized sugars. If you want a sweet beer, there are far better, more consistent ways to get that effect. Those are two different ways of writing the same thing. The first example is fairly self explanatory, the second example means hop X is added 60 minutes before the end of the boil, hop Y is added 15 minutes before the end of the boil and hop Z is added right at the end of the boil. You may even have hop additions that call for 90 or more minutes, but that is less common. Whatever the recipe calls for, start the timer when you add the first batch of hops, following the recipe for each hop addition. Keep an eye on the boil kettle for the first minute or so after every hop addition. The wort may foam up again, so you want to make sure it doesn't boil over if this happens. If you only added a portion of your malt extract at the beginning, add the rest for the last 15 minutes of the boil, making sure you stir it in very well. The recipe may even call for other additions as well, such as dextrose (corn sugar), spices or fruit extracts. Just add them as called for in the recipe. If you do have dextrose, make sure it's not meant to be priming sugar. If it is, don't add it to the boil, you'll need it later for bottling. Do not cover the pot during the boil. One of the things happening during the boil is that sulfur compounds and other things that make the beer taste bad are boiling off and evaporating. If you leave the lid on, these nasty compounds will stay in the beer, causing it to taste bad. Leaving the lid on also promotes boil-overs. From this point forward, do not let anything you haven't sanitized touch the wort or beer. When the time called for the boil in the recipe has finished, remove the boil kettle from the heat. Don't cover the pot, and as quickly as you can, bring the temperature down below 140ºf. At temperatures above 140ºf, the wort creates DMS, dimethyl sulfide, but because the wort isn't boiling, the DMS dissolves into the wort instead of evaporating away. DMS will give your beer a bit of a canned vegetable flavor. Creamed corn beer doesn't sound terribly appetizing to most people. Then, get it down to about 70ºf as quickly as you can. The speed at which this happens is a bit less important, but still somewhat important. After you get below 140ºf, you're entering the sweet spot for bacterial/fungal growth, and you've just made lunch for them (the sugary water). The sooner you get it down to 70ºf, the sooner you can pitch your yeast. The yeast doesn't really like competition, so it will help prevent infection. So, how do you actually go about cooling your wort? There are a few option. The first, and best option is to use a purpose built wort chiller . The problem with wort chillers are, they cost money, and this is your first batch of beer. Do you really want to spend an extra $40+ when you aren't certain you're ever going to use it again (although, I certainly hope you do decide to brew more beer after your first batch)? The second option is, fill your sink or bathtub with water, preferably ice water, and put the boil kettle in the ice water. Make sure you don't get the water in the boil kettle as it likely hasn't been sanitized. The third option is, if you've only done a partial boil, put the hot wort in your fermenter and top it off with cold water. If you do this, make sure you've boiled the additional water to kill any baddies that might be lurking in it, and then allowed it to cool before adding it to the wort. Also keep in mind that this can be dangerous if you're using a glass fermenter as the sudden change in temperature can cause the glass to shatter. Once you've cooled the wort to around 70f, you can take a measurement of the Specific Gravity of the wort using a hydrometer. The hydrometer will tell you what temperature it's calibrated for, and hopefully it came with instructions on how to correct the reading for different temperatures. Just float the (sanitized) hydrometer in the wort. The line/number that the hydrometer is floating at is your reading. Some sources state the correct way to read it is from the bottom of the meniscus (the surface tension of the liquid causes the liquid to creep up the side of the hydrometer a bit, this is the meniscus), other sources tell you to read from the top of the meniscus. For now, just pick top or bottom, and just be sure to read it the same way the next time you take a reading. After the wort has cooled, you need to transfer it to the fermenter (assuming you didn't choose the third option above.) If you're using a plastic bucket for your fermenter, just pour the wort into the fermenter. If you're using a Better Bottle or glass carboy for your fermenter, you can either use an Auto-Siphon to transfer the wort to the fermenter, or use a large funnel to help pour the wort into the fermenter. If you don't have 5 gallons of wort, top it off with water you've boiled to remove any bacteria/fungus. Yeast requires oxygen to multiply, so once you've transferred the wort to the fermenter, you need to aerate the wort. This simply means getting oxygen dissolved into the wort. You can use something like an air stone connected to an O2 tank or air pump with a HEPA filter. But again, that's extra money, and this is your first batch of beer. The other thing you can do is close up your fermenter and shake it. Shake it until you feel like your arms are going to fall off. The more you shake it, the more O2 that will be dissolved in the wort, the more dissolved O2, the healthier the yeast, the healthier the yeast, the better the beer. You'll eventually want to get something like the air stone setup, but you really don't need it right away. The last thing you need to do is add the yeast to the wort. This is called pitching the yeast. There really isn't any trick to doing this, just open the package of yeast and pour the yeast onto the wort. You don't need to mix the yeast in, it will get there on its own. For your first beer, I'm going to suggest you use dry yeast. You lose some control over the end flavor of the beer that way, but it's really the easiest way to go for your first beer. If you bought a liquid yeast, that will work OK for now. You typically want to create what is called a yeast starter when using liquid yeast, but we'll just go ahead and pitch the yeast without one for now. Once you've pitched your yeast, put the lid, carboy cap, rubber stopper on the fermenter and install the airlock. Put a little bit of water with sanitizer mixed in, into the airlock to keep anything from passing through it the wrong way. The yeast will now begin multiplying and converting the sugar into alcohol. This is called fermentation. If you're using clear glass/plastic container for your fermenter, keep it somewhere very dark, or at least out of the light. If you don't have anywhere appropriate, put an old t-shirt over it, or wrap it in a towel. You just don't want the beer/wort exposed to the light if you can help it. After 1-3 days, you'll get a thick, foamy head on top of the beer, this is called krausen. It's a mixture of wort/beer, CO2 and yeast. This is a good thing. The airlock will also likely bubble quite a bit. Don't worry if it doesn't though. Fermentation will take about a week. After 3-5 days, take a small sample of your beer and take a reading of the specific gravity of the beer with your hydrometer. The reading should be lower than it was before you added the yeast a few days ago. If the reading isn't lower, there's a problem. Either your yeast didn't start fermenting the wort, or you're not using the hydrometer properly. Don't pour your beer sample back into the fermenter. You can either drink it to see how it tastes, or pour it out. It's better to waste a little beer now than to risk infecting the whole batch. Don't worry if it doesn't taste good now, it still has a few weeks before it'll really be ready to drink anyway. Take SG (specific gravity) readings every 1-2 days until you get 3 readings in a row that haven't changed. Once the SG has stopped dropping, your beer is ready to bottle. If you screw up any step along the way, don't panic, it's likely that everything will be OK. As Charlie Papazian likes to say in his book The Complete Joy of Homebrewing, "relax, don't worry, have a homebrew", or in your case, a commercial beer, as this is your first batch. This post is already more than long enough, so next week I'll cover bottling the beer. Also, to any beginners reading, do not let the entire process seem daunting. It really is worth it and it isn't as complex as it sounds!